You know about President and General Dwight Eisenhower’s prescient warning about the “military-industrial complex” as he left the White House? Well, it turns out that he was really warning about the “military-industrial-congressional” complex. In the spring of 1961, I was part of a small group of undergraduates who met with the president’s brother, Milton Eisenhower, who was then president of Johns Hopkins University. Milton Eisenhower and a Johns Hopkins professor of political science, Malcolm Moos, played major roles in the drafting and editing of the farewell speech of January 1961. The actual drafter of the speech, Ralph E. Williams, relied on guidance from Professor Moos. 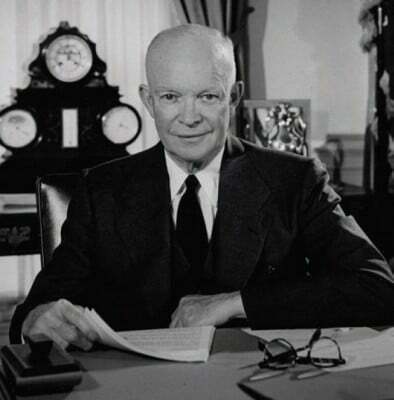 Milton Eisenhower explained that one of the drafts of the speech referred to the “military-industrial-Congressional complex” and said that the president himself inserted the reference to the role of the Congress, an element that did not appear in the delivery of the farewell address. Indeed, Congress members – part of the fatcat club which makes money hand over fist from war – areheavily invested in the war industry, and routinely trade on inside information … perhaps even including planned military actions.